At CNC, we believe success is directly proportional to ingenuity and innovation. Our dedication to delivering quality products have engendered a standard that we challenge anyone to match. Our conscientiousness about quality control guarantees strict monitoring and measurement coordination on all jobs, from initial step to final product. 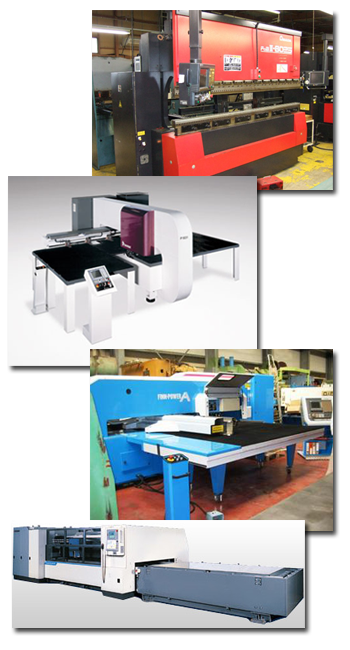 This multi index turnet punch press combined with modern, high speed tooling provides accurate and cost efficient solutions to sheet metal fabrication. It provides contouring and forming in a variety of materials including aluminum, stainless steel, cold rolled steel, brass and copper with thicknesses from 0.015" to 0.250". The precise upper and lower ram movements help to create special flangs and forms, thus reducing the need for secondary operations. This laser system is capable of cutting aluminum, stainless steel, steel, delrin, and variety of other materials. This 4000W laser system allows for unlimited flexibility in shape and size in tight tolerances. Together with automatic material shuttle system this translates into better product for our customer at a reasonable cost. Laser QC inspects parts quickly and accurately. It is designed with software functionality and measurement accuracy for the most demanding inspection requirements. The functionality of the software permits the user to generate and then optimize a CAD file from a scanned image.